Generations of Knoxvillians have fond memories of the Ice Chalet as their after-school playground, a place to learn skating and hockey, and a Friday night social center. The familiar refrains of Tijuana Brass and "The Candy Man" still seem to linger in the air, but it's a trick of the mind. The Friday night "couple skate" sessions were a crowd favorite, and the flashing mirror ball itself is still in place. New generations of students continue to find a second home in this comfortable setting.The Ice Chalet was built in 1962 by a corporation known as "Chalet Ice Rinks, Inc." The primary investors were Chambliss Pierce, Harkness Construction Co., Pilot Oil Corp., and Brownlee Kesterson Construction Co.. It was one of the first two skating rinks in the South with regularly scheduled hours for public skating. 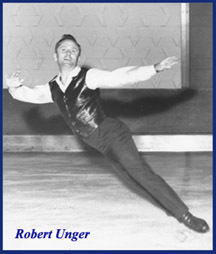 In 1963, a professional ice skater and star of "Holiday On Ice" named Robert Unger moved to Knoxville and established the Robert Unger School of Ice Skating here as well as in Huntsville, Alabama. Note: The skating school's logo is an artistic rendition of Robert Unger's trademark fedora. It was designed c. 1996 by Patty Googe, whose family skated as a part of the school for several years. And just in case you hadn't figured it out for yourself, the German phrase "Schule für Eiskunstlaufen" literally means "School for Figure Skating." The first few years of operation were a struggle financially. However, in 1964, Unger became the General Manager and Vice President of Chalet Ice Rinks, Inc., and over the next ten years he was instrumental in developing the skating rink into a highly successful enterprise. 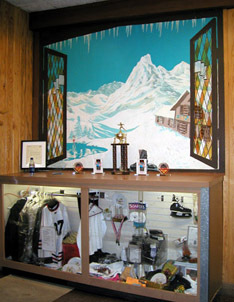 In 1969, the Ice Chalet hosted one of the first skating competitions endorsed by the Ice Skating Institute of America (ISIA, now ISI), known as the Mississippi Valley District Invitational Team Competition (MVDC). The MVDC has been held annually ever since, regularly attracting teams from all over the eastern United States, and it is the oldest continually running competition of this kind in the world. 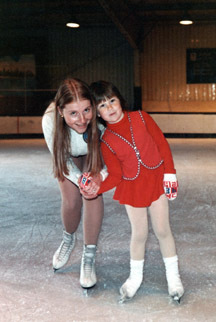 In 1977, the MVDC became the first international ISIA (now ISI) figure skating competition with a team from Canada. The name of the competition was changed to the Robert Unger ISI Competition in 2009. A graphic depiction of the Ice Chalet's iconic main entrance was created in 2002 by Julia Hardin (bringing Larry LaBorde's vision to life) to help market the rink's growing list of programs. In 1971, the Robert Unger team participated for the first time in the Mid-Atlantic District Competition in Lake Placid, New York, and they won first place. They repeated the victory in 1972 and again in 1973, 1979, 1990, and 2004. The expense of out-of-town competitions led to the creation of Robert Unger Moms and PopS (RUMPS) in 1985. RUMPS was an organization of skaters and parents that helped raise travel and costume funds for the skaters. RUMPS' founder was Pat Kington. RUMPS eventually evolved into a non-profit organization, The Ice Chalet Skating Club of Knoxville. Beverly Horner is in focus while a large group of skaters practice their freestyle moves for an upcoming competition. has always been a popular gathering place. 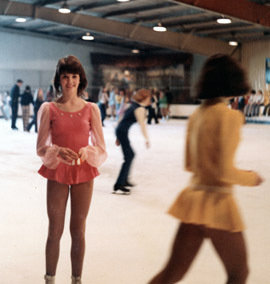 Starting sometime in the mid-1960s, the instructors at the Ice Chalet introduced ice skating and hockey into the curriculum of The University of Tennessee. UT was the only university in the South offering skating classes at that time. In 1983, another landmark event in recreational figure skating was achieved by a Knoxville skater. Jon Robinson, a student of the Robert Unger School, became the first male skater in the world to compete at the Ice Skating Institute's highest level, Freestyle 10. The Ice Chalet had presented special shows every year since the skating school began, including Swan Lake and other musical productions. In 1987, students in the Robert Unger School first performed Nutcracker On Ice, and it has played to enthusiastic audiences each Christmas ever since. Many skaters have grown from one role to another, year after year, as they progressed in the skating school. The Ice Chalet IceHawks logo was created in 2004 by Julia Hardin. In 2016, the name of the school was changed to The Robert Unger and Larry LaBorde School of Ice Skating. In 2018, the school's hat logo was changed slightly to incorporate Larry LaBorde's name. Open for business in the Fall of 1962, the Ice Chalet building has held up well over the years with a considerable amount of preventive maintenance (and no small amount of patience). The cooling pipes and header were replaced in 1992. One of the two compressors still in use at the Ice Chalet in 2002 was 75 years old. The first ZAMBONI ® ice resurfacing machine used at the Ice Chalet was built in 1955. The Zamboni ® company purchased and restored this machine, which is now on display at the company's museum in California. 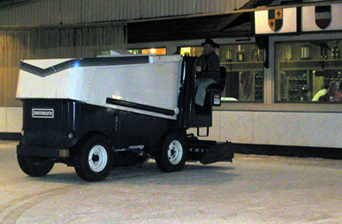 The Ice Chalet purchased its second ZAMBONI ® ice resurfacing machine in 1972, and a backup machine was also purchased. In 2014, longtime staff member Gregory Fuller helped the Ice Chalet Skating Club purchase an electric Zamboni for the Ice Chalet. Yes, that's Robert Unger at the wheel in February of 2003! There have been some additions to the facility over the years. Viewing booths and party/dressing rooms were added in the early 1990s. The "crows nest" -- a control room for the extensive lighting system -- was built in 1992. 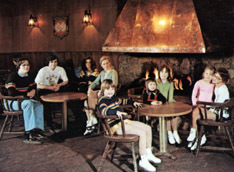 The Café Chalet, a restaurant operated by skaters and their parents, was built and opened in 1999. In the early 2000s, windows were added along the wall that parallels Kingston Pike. In addition to Robert Unger, there have been some special people who took care of the facility and the skaters on a daily basis for many, many years. Two of the best known are Chambliss and Ruth Pierce. 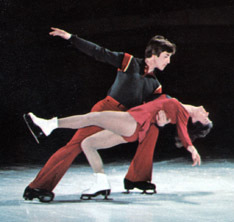 The Pierces were a part of the Ice Chalet from the beginning until they retired in the 1980s. 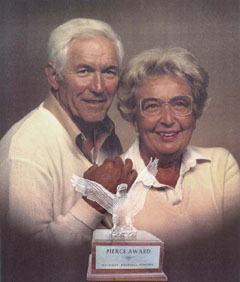 The Pierce Award was established in 1998 in their honor and is awarded at each annual MVDC (now Robert Unger ISI Competition) to the top place team. Dan Baird, who took over for Chambliss Pierce when he retired. Shawnda Ernst, who served as Skating School Director for many years. 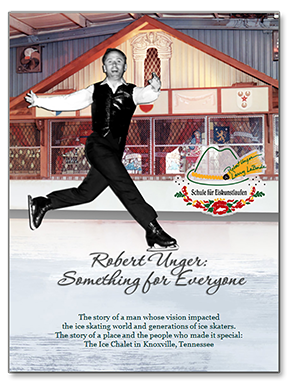 Link to More Information about "Robert Unger: Something for Everyone"